On the 27th of January 1945 troops of the Soviet Union pushed German forces out of the lands west of Krakow, near the small town of Oświęcim. What they discovered and liberated there, has become one the most enduring and infamous symbols of the holocaust in Europe. Today known under their German names, the camps of Auschwitz and Auschwitz-Birkenau, were once part of the largest complex of concentration camps built by the Nazis during World War II. When liberated in 1945, the Russians found less than 600 survivors at Auschwitz, but today the Auschwitz-Birkenau State Museum that operates on the grounds remembers each of the 1.3 million victims of genocide, torture and imprisonment, along with every survivor that endured the horrors of Auschwitz. There are various tour options for visiting Auschwitz-Birkenau including transportation to and from Krakow which you can book online. In 1979 the entire site of the Auschwitz-Birkenau camp was inscribed by UNESCO, who have said it is a continuing ‘monument to the strength of the human spirit which in appalling conditions of adversity resisted the efforts of the German Nazi regime to suppress freedom and free thought’. It is these efforts in the post-war period that have established the site as an appropriate centre of memorial and education, where visitors come face to face with the unbridled barbarism and brutality of the Nazi regime. Of the camp complex as a whole, two sections are open to visitors; the smaller Auschwitz I and the larger Auschwitz II-Birkenau camp. The first is very well preserved, and the centre of most of the camp’s functional buildings. Here, the cell blocks of political prisoners and POWs, medical experimentation wings, solitary confinement cells, standing cells and administrative rooms, were later divided from the larger population of the camp that were kept at Auschwitz-Birkenau. 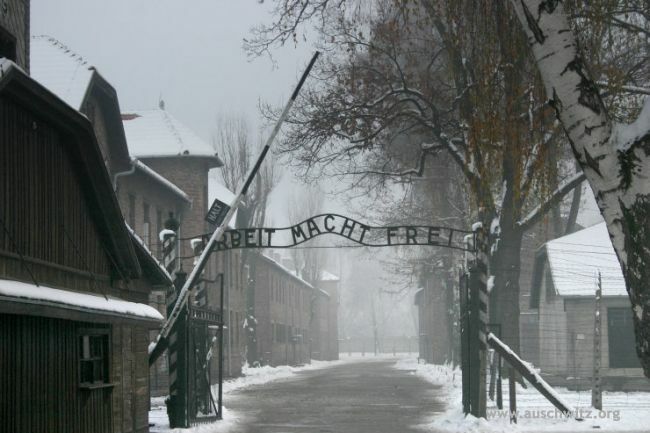 At the entrance to Auschwitz I, the infamous, metal-crafted sign that reads ‘Arbeit Macht Frei’ looms over the gateway. It’s the oft recalled image of this dark place, where deception and death went hand in hand. The original was stolen in 2005 to much public outrage, and while the perpetrators were discovered and the sign returned to the museum, a replica now stands in its place. The larger camp (Auschwitz II-Birkenau) is now largely in ruins, though some enduring structures still remain. Most notable perhaps, is the ominous frontispiece and rail gate that lead right through the centre of the grounds, and stops at the monolithic memorial art that now dominates the treeline on the north side. Inside the camp, the red-brick chimney stacks mark out where each of the housing blocks would have stood, and give an impression of the sheer scale of the grounds. Today, tours are respectful in their delivery, and give a very comprehensive history of the camp and what went on there. Each guide is highly qualified and dedicated solely to leading tours around the camps. From start to finish it is recommended visitors leave at least three hours to cover both Auschwitz I and Auschwitz II-Birkenau, while the journey from Krakow to the museum takes around 1 and half hours. More than 1 million people every year visit the Auschwitz museum and camp complex, to pay homage and their respects to the millions who were affected by this; one of history’s greatest of crimes. See our photo walkthrough of visiting Auschwitz-Birkenau so you can get a sense of what you will be witnessing.